Because so many people use needles to inject heroin, this community is vulnerable to an outbreak of the AIDS virus. Public health experts have been warning us about this for months -- years, even. Unfortunately, those warnings received little more than lip service from the government leaders in the counties, cities and towns in Northern Kentucky and Greater Cincinnati. Now, what the experts tried to alert us to is happening: a significant rise in new cases of HIV infection directly linked to needle use. The number of new cases of HIV in Hamilton County rose 34 percent in 2017, to 184. Even worse, the proportion of those infected people who use needles to take drugs more than doubled, to 20 percent. In four Northern Kentucky counties (Boone, Campbell, Grant and Kenton), half of the 37 new cases of HIV in 2017 were linked to injection drug use. There you have it: Significant increases in new HIV cases on both sides of the river linked to the illicit use of needles to inject drugs. Is there any good news in all this? Yes. There is still time to check the spread of HIV, but urgent action is needed. It will take a united effort of local political leaders working closely with our public health experts. It will need to start in Newport, where city commissioners haven't even taken up the issue despite the warnings and the information they've heard from the Northern Kentucky Health Department. Kentucky state lawmakers set up a number of hoops that cities and counties need to jump through before needle exchanges can be set up. The bottom line is, county officials must approve it, then one city within the county must do so. Campbell County, in which Newport is located, has already approved an exchange. It's now Newport's turn. What are they waiting for? A full-blown crisis? That's what it took in Indiana before state officials would even permit needle exchanges. To wait that long here, knowing what we know and seeing what happened in Scott County, Indiana, and other communities, would be political malpractice. Dr. Judith Feinberg is a nationally recognized expert in HIV, AIDS, and drug abuse. She pushed for years to establish a needle exchange in Cincinnati. She finally succeeded in getting the ok for a van that travels to three urban locations a week. Dr. Mike Kalfas is Northern Kentucky physician whose practice includes many people who suffer from heroin and opioid addiction. He's also frustrated with political inaction. What they're saying is not new; other public health officials have been saying it. What's new now is the sense of urgency. New needle exchanges can and should be quickly set up. "Syringe services programs need to be expanded all over this region," Dr. Feinberg said. "This epidemic hasn't peaked and maybe won't peak for some years to come." 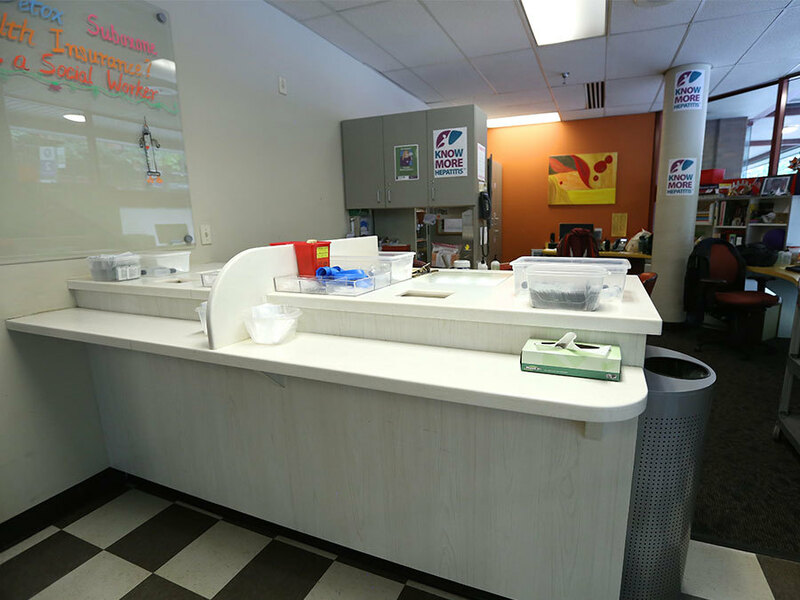 Currently, Northside is one of only three locations for the Cincinnati needle exchange. The Northern Kentucky Health Department campaigned for needle exchanges for a long time. The three main counties there have none, despite a rise in cases of hepatitis C, which is also spread through needles. The health department has an office in downtown Newport that could be used for a needle exchange. All it would take is a vote by Newport city commissioners. They won't even take it up. Kenton County and its county seat, Covington, are playing a "You go first! No, you go first!" game. Both the county and the city have agreed to allow a mobile exchange program, but only after another nearby community in another county approves one, too. They're playing games with people's lives. In Colerain Township, a plan was in place, a site was donated by a local business, but township trustees backed away. Now is the time for them to step up. We understand that needle exchanges are tough things to comprehend. They even sound counter-intuitive. Handing out clean needles to people who suffer from addiction? That just encourages them to shoot up, right? And giving out not just needles, but clean cotton balls and sterile water -- the basic equipment someone who needs for a daily (or more frequent) injection of heroin or something like it just to function. That's just giving a thumbs up to do more, right? Anyone who has experienced heroin addiction will say that the addiction is so powerful it overwhelms the desire for anything else. Users will inject with or without clean equipment. They will share needles with others who share the same addiction. There's no better way to spread a virus than by injecting it directly into the blood through the tip of a needle. That's the point of needle exchanges – to limit the spread of HIV, hepatitis C and other contagions. Public health experts call it "harm reduction," the effort to limit the collateral damage wrought by an epidemic of injection drug use. They make sense from a financial perspective too. The cost to run a needle exchange for a year is roughly half what it costs to treat one case of HIV for a lifetime. Although needle exchanges are not the answer to the heroin epidemic, they can be part of a solution. They can be staffed by people who understand addiction and can guide the addicted into treatment. A syringe exchange at a health center in downtown Seattle. While our community has been slow to accept needle exchanges, others have adopted them. About 200 cities in the U.S. have syringe exchange programs. They have been part of the landscape for years in Seattle, where WCPO reported an in-depth story last year. RELATED: Moving the Needle: How far should we go to save lives in the heroin crisis? The rise in HIV linked to drug use should be a loud wake-up call for the elected government leaders in Newport, Covington, Kenton County, Colerain Township, Hamilton County and all over the region. It's time to wake up and put public health above politics.